The pH dependence of maximum chlorophyll fluorescence yield (Fm) was examined in spinach thylakoids in the presence of nigericin to dissipate the transthylakoid pH gradient. 3-(3′,4′-dichlorophenyl)-1,1-dimethylurea (DCMU) was present to eliminate photochemical quenching. Thylakoids were prepared from dark adapted leaves (‘dark’ thylakoids) or preilluminated leaves (‘light’ thylakoids). In the latter there had been approximately 50% conversion of the xanthophyll violaxanthin to zeaxanthin, while no conversion had occurred in the former. In the presence of a reductant such as ascorbate, antimycin A sensitive quenching was observed (half maximal quenching at 5 μM), whose pH dependence differed between the two types of thylakoid. 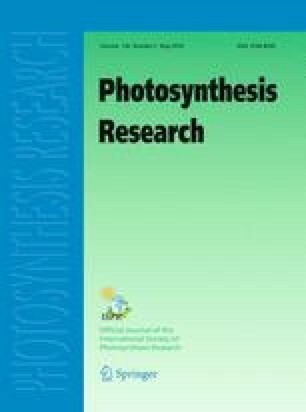 Preillumination of leaves resulted in more quenching at pH values where very little quenching was observed in ‘dark’ thylakoids (pH 5–7.6). This was similar to activation of high-energy-state quenching (qE) observed previously (Rees D, Young A, Noctor G, Britton G and Horton P (1989) FEBS Lett 256: 85–90). Thylakoids isolated from preilluminated DTT treated leaves, that contained no zeaxanthin, behaved like dark thylakoids. A second form of quenching was observed in the presence of ferricyanide, that could be reversed by the addition of ascorbate. This was not antimycin A sensitive and showed the same pH dependence in both types of thylakoid. The former type of quenching, but not the latter, showed similar low temperature fluorescence emission spectra to qE, and was considered to occur by the same mechanism.